William couldn’t stop his head from spinning. Moments before, he had held Elizabeth in his arms, his lips just inches from hers. Now she stood several feet away, arms crossed over her chest. Caroline wore a brittle smile on her face and a murderous gleam in her eye. “What do you want, Caroline?” he stammered, trying to clear his mind. “I need to speak to you at once,” she proclaimed, her attempt at a regal bearing spoiled by her petulant tone. “It’s private.” Caroline stared pointedly at Elizabeth. Elizabeth’s eyes flashed, but she didn’t answer Caroline. Instead, she flashed William a tight smile and headed up the path toward the Terrace Room. “Charles is in love, and he expects to be married for the rest of his life. He probably doesn’t think a pre-nup would serve any purpose.” William found himself in the awkward position of arguing for the very point he had argued against earlier that day. “All right, I will.” At the least, he needed to warn Charles that his house of cards was about to topple, courtesy of Hurricane Caroline. “I knew I could depend on you to help me.” She took his face info his hands and kissed him enthusiastically on the lips before he could stop her. He pulled away in disgust. Wouldn’t you know she’d be the one I’d get a kiss from tonight? When Elizabeth saw William step through the doorway from the courtyard, the trembling she had finally conquered began again. He had almost kissed her. He would have kissed her, had Caroline not stormed across the courtyard and all but flung him over her shoulder in her proprietary zeal. And the kiss would have been no innocent peck on the lips. The flames leaping in his eyes had made that all too clear. But the memory of his heated expression wasn’t what set her body quivering. The startling fact was this: she had wanted his kiss, had craved it with an intensity that halted her breathing and made her knees wobble. A renegade impulse whispered in her ear, daring her to cross the room and press her mouth to his, past caring about the curious eyes surrounding them. Get a grip, Lizzy, before the guys with the butterfly nets and straitjackets show up. It was good advice. These impulses were dangerous, even self-destructive. William Darcy didn’t kiss insignificant schoolteachers. And if he did, he could have only one thing in mind: the location of the nearest vacant bed. She wrenched her eyes away from him, her jaw tight. But her eyes, heedless of her inner struggle, drifted back in his direction. He met her gaze, and the warmth brimming in his eyes engulfed her. But then he strode past her, crossing the room to join a group that included Charles, Jane, and the Bingleys. As he passed, she noted smudges of red lipstick on his cheek and mouth. And Caroline’s lipstick—her bright red lipstick—was smeared and in need of repair. Now it all made sense. William hadn’t wanted to kiss her—at least, not only her. Any available woman would do. All the better to feed his oversized ego. So stop acting like a swooning idiot. A few minutes in the moonlight with a horny pianist and you lose your mind. As she stood there lecturing herself, the band announced a short break. Charlotte and Roger left the dance floor together and approached her. Elizabeth didn’t answer, too occupied with watching Charles and William heading for the doors to the courtyard. Before Elizabeth could begin her story, Roger returned with the drinks. Charlotte drew him aside for a brief conversation, and then led Elizabeth to a table near the doors to the courtyard. Roger sauntered over to a table where the members of Golden Gate Jazz were comfortably ensconced. “He didn’t mind?” Elizabeth asked. “About time you figured that out.” Elizabeth returned to her story, describing her time alone with William in the courtyard and leading up to the moments after the music stopped. “I do, but it’s fun watching you squirm,” Charlotte teased. “So, could you tell if Lydia and I were right about the long-fingers business?” Charlotte asked with a wicked grin. “I should wash your mouth out with soap,” Elizabeth sputtered. Caroline swept through the doors from the courtyard and, with great self-importance, interrupted Jane’s conversation with Mrs. Bingley. As Elizabeth and Charlotte watched, Caroline took Jane’s arm and led her firmly out to the courtyard. William would have whole-heartedly endorsed Charlotte’s remark, had he heard it. He had been warning Charles about Caroline’s discovery, and advising him to speak to Jane without delay, when Mr. Bingley marched up to them breathing fire and brimstone, with Caroline mincing along at his side. William had half expected to see canary feathers protruding from her mouth. And now Caroline was back again, with a perplexed-looking Jane in tow. William was surprised to see Elizabeth join the group. She stopped beside Jane, who gave her a quick, nervous smile. “Charles?” Jane pleaded. She stepped across the circle of combatants to stand beside him. Charles opened his mouth to speak, but no words came out. “Jane hasn’t been asked to sign a pre-nup, Mr. Bingley,” Elizabeth interjected. Charles, after a long pause, finally nodded. “You honestly never gave it to her?” Mr. Bingley asked, glowering at Charles. “No.” Charles shot a beseeching glance in William’s direction, but William couldn’t think of anything to do or say. “And why didn’t you tell me this?” Mr. Bingley growled. “How dare you speak about my sister that way?” Elizabeth snapped. “Now, really, Mr. Bingley—” William protested, walking around to stand beside Elizabeth. William could feel waves of fury rolling off Elizabeth’s body. He placed his hand on the small of her back in a soothing gesture, and she took a small step toward him, flashing him a look of surprised gratitude. That much had been inevitable. William hoped the remaining conditions would be no worse. “I know Daddy may sound a bit harsh, Jane, but I’m sure you understand that we need to protect the family business,” Caroline remarked in a conciliatory tone. Jane looked toward Charles in a silent appeal for support that even William could read. But Charles, his shoulders slumped and his eyes downcast, said nothing. Charles looked up, but remained silent. He resembled a frightened dog cowering before an angry master. Elizabeth gasped. William again touched her back gently, and she took another small step toward him. William pulled himself up to his full, impressive height. “I am a bad influence?” He spoke each word slowly, in as lofty a tone as he could muster. For Charles’s sake, William would not allow Mr. Bingley to goad him into an angry response, but only his long experience in the public eye allowed him to stay silent. He wished that he knew how to count to 100 in Italian; counting to ten couldn’t possibly be enough. As he labored to regain his composure, he was surprised to feel Elizabeth’s soft touch on his back, mirroring the gestures of support he had offered her. “What will we say to our guests?” Jane asked Charles. “I’ll help with that,” William said. He was immediately rewarded by her tremulous smile. William and Elizabeth had agreed on this vague cover story before leaving the courtyard. Elizabeth would have told her father the truth had the opportunity presented itself. But she hadn’t found a way to separate him from her mother, whose volatile reaction was best delayed until the drama had been resolved one way or another. Elizabeth flashed her father a look of weary gratitude. Elizabeth glanced toward William in mortification, but he was ushering the Hursts out the door and had missed the exchange. Mrs. Bennet rushed off to the ladies’ room to assist Kitty, with Lydia stumbling along behind her. Bill Collins approached, his raincoat over one arm. The combination of worry for Jane and fatigue from her long day overwhelmed Elizabeth, and the tears she had been fighting spilled down her cheeks. Mr. Bennet embraced her gently. William approached them as Elizabeth stepped out of her father’s embrace. He pulled a handkerchief from his pocket and handed it to her. The sympathy in his eyes made her want to cry all over again, but she took a deep breath and blinked hard, clearing her vision. She had to stay strong for Jane. 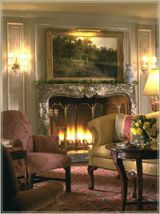 The other guests were finally gone, leaving William and Elizabeth alone together in the Terrace Room. He noticed her surreptitiously wiping a tear from the corner of her eye, and a protective instinct welled up in his chest, squeezing his heart. It was everything he could do to restrain himself from drawing her into the comforting circle of his arms and kissing away her tears. “May I give you a ride home? I’ll even let you drive again.” It was the only thing he could think of that might cheer her up. Indeed it did, since it gave him a chance to spend some time with her. As they left the Terrace Room together, he caught himself humming quietly. “You seem pretty chipper, considering everything that’s going on,” she remarked. “I suppose so,” he answered as they approached the bank of elevators. “I must have just caught my second wind.” He felt a pang of guilt when he realized that she was right. A somber mood was more fitting, given the unpleasant scene in the courtyard and its likely impact on Charles and Jane’s future. But then Elizabeth smiled at him. Without realizing what he was doing, William began to hum again.